Since I have been In Namhamsanseong the Weather here has become bitterly cold. Often at night when I am on the back roads of winding mountains I run into patches of ice. The temperature here at night is usually around 25F but sometimes it drops to the low teens. At first I had a pair of REI snow sport gloves which did rather well until they get wet, which then makes it difficult to twist throttle or pull the brake lever back. Especially when the gloves freeze to the Grips on the Scooter. So looking at the people that live in this area I notice that they have Over Sized Mittens that are strapped directly to their bike. I thought this was a bit curious but once I inspected a pair I found them to be well manufactured and rather easy on the wallet. I bought a pair about 2 weeks ago. They cost 15,000 won which is the equivalent of about 11.00 dollars American. They by far are the coziest contraptions I have put on any of my scooters. If you want something that is well worth the money I would suggest you get a pair of these to keep under your seat or just on your handlebars for the colder months of the year. Taking them off and on is about as simple as putting on a pair of gloves. There are two holes on the inside of the mitten that allow the Brake/clutch levers to go threw as well as the throttle/grip. 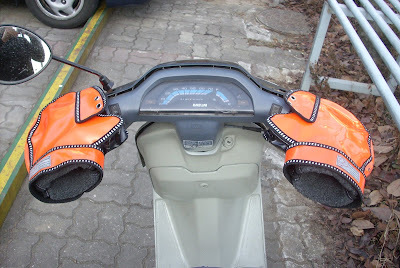 There is also a thin nylon water proof membrane at the thumb area of the mitten that allows you to press buttons on the instrument panel of the scooter. They come in nearly all the standard colors Black, Green, Blue, Yellow, Orange, Red, and Silver. The inside is lined with a synthetic Fur which keeps the hands nice and warm no matter what your speed. However I would still recommend some sort of Biking gloves so you don’t have to loose any heat when you grab the throttle or the brake lever. 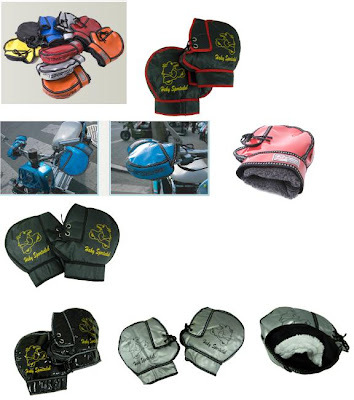 If you are interested in purchasing some of these well made mittens for your scoot then just message or email the manufacturers and they can send you a brochure. The only problem you may run into is that these mittens are only made in Seoul, so the website is written in Hangul. So it is difficult to read, also to order. The best bet would be to find some one who can supplies these in the states. I have seen a few on Ebay here and there but the price is usually in the 40.00 dollar range. Since Seoul is the only place I know of the manufacturers these mittens it makes them some what difficult to advertise since this is the farthest north where scooters and moped still outnumber cars. In other Asian countries they are still warm enough not to require these mittens in the winter. But here in Seoul Frost bite is a reality to the person that does not protect there digits from the elements of the winter. Above is an example of the styles and colors Haky Offers. 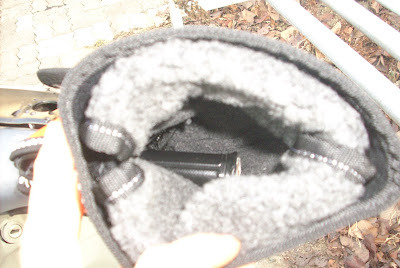 Below shows you how the grips and levers are accesable from the inside of the mitten, and you can see the faux fur. I LOVE these mittons. I want to order a pair before it gets too cold here in NYC. Can you help me find a link to order them? I'm googling everything I can think of but no luck. I can't see to contact you any other way.